The Big Event at the Bicycle Casino in Bell Gardens, California began this past weekend with a 417-player field. Today, Victor Ramdin emerged the victor over a stacked final table to claim the $500,000 first-place prize. 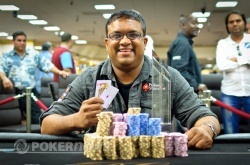 At the start of the day, eight men had dreams of capturing The Big Event title including two superstars of the game: Ramdin and 2005 World Series of Poker Main Event Champion Joe Hachem. Needless to say, all eyes were on them as action got underway. It was a long and treacherous final table, one that was aired on the Bicycle Casino’s popular Live at the Bike webcast. It didn’t take long for the first elimination of the day. It happened when Santiago Nadal put in a standard raise only to be reraised to 205,000 from Victor Ramdin in the small blind. When the big blind folded, Nadal moved all in for 898,000 and Ramdin called. De Noronha was the one at risk as the flop came out . Hachem had vaulted to the lead and left his opponent in bad shape. The turn and river changed nothing and De Noronha followed Nadal out the door in seventh place. The next to go was Govert Metaal who three-bet shoved preflop for around 500,000 with and was called by the of Hachem. A queen on the flop was all it took and Metaal hit the rail in sixth place. It took a couple hours for the next elimination, but it finally came in the form of Bryan Leskowitz, who failed to crack Jeremy Ausmus’ with his . The board ran out flop left von Kriegenbergh drawing thin, but it was the turn that left him drawing dead. Von Kriegenbergh became the fourth-place finisher, prompting him to say of his $140,000 haul, "It's a good chunk of money. It's about $100,000 more than I've made in any tourney." Three-handed play was a marathon as well and didn’t conclude until Ausmus opened to 225,000 from the small blind and Hachem defended his big. When the flop came down , Ausmus bet 280,000, Hachem shoved all in, and Ausmus called for his tournament life, committing his final ~1.3 million to the pot. Hachem's top pair was in the front, and he was two cards away from sending this match into heads-up play. The turn and river sent Ausmus to the rail in third place and ensured a heads-up match between two of the game’s top pros. Hachem entered with 7,090,000 to Ramdin’s 5,420,000 and it took about ninety minutes of back-and-forth action before things came to a head. The rest, as you’ve certainly read below, was history. Congratulations to Victor Ramdin for taking down The Big Event Main Event title and laying claim to the $500,000 first-place prize. That doesn't conclude our coverage from the Bicycle Casino as we'll be back tomorrow and Saturday to bring you all the action from the Bounty Shootout. Hachem was in a dominate position and in great shape to double. That all changed when the flop came down and gave Ramdin top two pair. Hachem's face dropped with disappointment. The dealer proceeded to burn and turn the , which gave Hachem some extra outs. "Queen ball, baby," Hachem pleaded. Unfortunately for the 2005 World Series of Poker Main Event Champ it was not meant to be as the peeled off. He was eliminated from The Big Event just one place shy of the title. Joe Hachem opened the pot with a button-raise to 250,000, and Victor Ramdin made the call. The dealer burned and ran a flop, which Ramdin checked. When Hachem bet 300,000 though, Ramdin check-raised to 700,000 total. Hachem's response? An all-in reraise, and that shook Ramdin off his cards. "How do you like them apples?!" Hachem poked. Joe Hachem limped his button, and Victor Ramdin used his option to raise to 300,000. Hachem called. The flop rolled out , and Ramdin knocked the table. Hachem took his cue to fire at the pot, making it 350,000 to go. Ramdin instantly called. The turn came the , and Ramdin checked again. Hachem wasn't slowing down just yet, and he made a second stab at the pot as he pushed out 875,000 more chips. Once more, Ramdin came right along with the call. On the river, Hachem got the message and checked it back, and his check may well have saved his tournament life. Ramdin tabled , and his pocket pair was good enough to earn him the pot and a commanding lead in this duel. Joe Hachem limped in from the button, and Victor Ramdin knocked the table for a free flop from the big blind. The flop came out , and Ramdin checked. That let Hachem bet 200,000, but Ramdin snuck in with a check-raise to 550,000 total. Hachem called. Ramdin checked again when the hit fourth street, and Hachem took his cue to bet 1 million straight. Check-raise me twice, shame on me. Ramdin check-raised all in, and Hachem called off his last ~2.1 million to put himself at risk. Ramdin was dead to a chop, and the river was a miss. That gives Hachem the double up as the two men once again draw nearly even in chips. 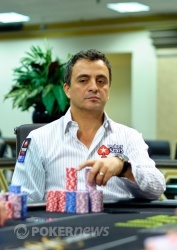 From the button, Joe Hachem opened to 250,000, and Victor Ramdin three-bet to 725,000. Hachem called, and off they went to the flop. It came , and Ramdin led out with 500,000. Hachem called, and both men checked through the turn . That brought them to the river, and Ramdin loaded up and fired again, 1.2 million this time. Hachem called, and those were chips he'd have to kiss goodbye. Ramdin tabled for top pair, and that was good enough to take it down. Hachem is now down around 3 million. Victor Ramdin limped from the button and Joe Hachem checked his option in the big blind as the came out on the flop. Hachem checked, Ramdin bet 150,000, Hachem made it 500,000, Ramdin reraised to 1.1 million, Hachem moved all in, and Ramdin called off for a total of 3.58 million. Hachem had flopped top pair and an open-ended straight draw, but was far behind the flopped straight of Ramdin. The turn and river changed nothing and Ramdin doubled to over 7 million while Hachem dropped to around 5 million. 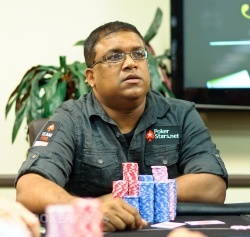 Victor Ramdin raised on the button and Joe Hachem called as the pair watched the flop come down . Hachem check-called a bet of 350,000 from Ramdin which lead to the on the turn. This time is was Hachem who fired out 500,000, which got Ramdin off the hand. 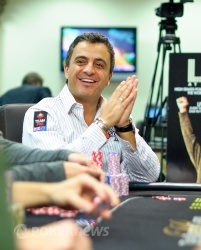 In the second hand of heads-up play, Joe Hachem raised on the button and was met with a three-bet from Victor Ramdin. Hachem refused to back down and went ahead and four-bet, which Ramdin called. When the flop came down , Ramdin checked, Hachem bet 1.1 million, and Ramdin folded. First significant pot to the 2005 World Series of Poker Champion.